NASA astronaut Christina Koch participates in her first spacewalk to upgrade the International Space Station’s power storage capacity. 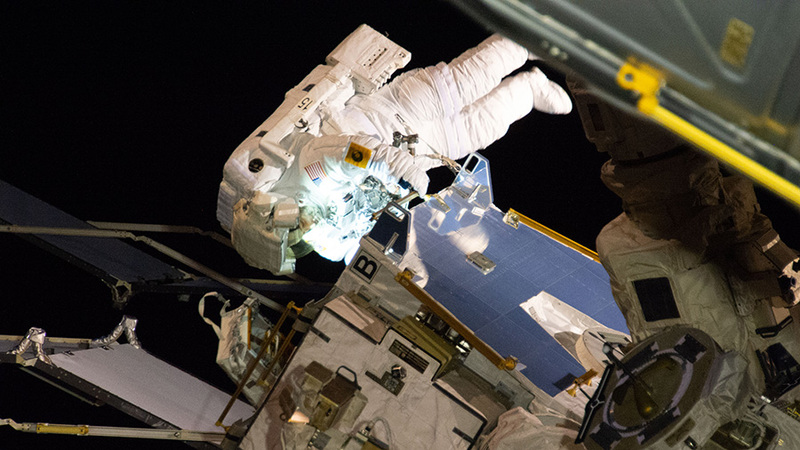 She and fellow spacewalker Nick Hague (out of frame) of NASA worked outside in the vacuum of space for six hours and 45 minutes to continue swapping batteries and install adapter plates on the station’s Port-4 truss structure. April is shaping up to be a busy month bringing three new spaceships and another spacewalk to the International Space Station. The Expedition 59 crew has already wrapped up two spacewalks this year and welcomed the first SpaceX Crew Dragon spacecraft and the latest Soyuz MS-12 crew ship in March. Roscosmos, SpaceX and Northrop Grumman are all readying their resupply ships to blast off this month and replenish the six orbital residents. A pair of astronauts will also go on another spacewalk, this time to provide secondary power for the Canadarm2 robotic arm. At the Baikonur Cosmodrome in Kazakhstan, the Russia’s Progress 72 cargo ship, loaded with more than 3 ½ tons of food, fuel and supplies, rolled to its launch pad Monday for final preparations for launch Thursday, April 4 at 7:01 a.m. EDT. The launch will send the unpiloted Progress on a 2-orbit rendezvous trajectory — the second ever — for an automated docking to the Pirs docking compartment three hours later. NASA TV will broadcast live the express cargo delivery to the orbital complex. On Monday April 8, two astronauts will go on the third spacewalk of 2019. Flight Engineers Anne McClain and David Saint-Jacques will set their spacesuits to battery power around 8:05 a.m. and exit the Quest airlock. The duo will install truss jumpers on the Unity module and the Starboard truss structure to ensure the Canadarm2 stays powered in the event one of its other power units fail. Finally, two U.S. spaceships will blast off toward the station this month from two different launch pads on the U.S. east coast. The orbital lab will be host to six different spacecraft, including two Russian Progress space freighters and two Russian Soyuz crew ships, by April 28. Northrop Grumman will launch its 11th Cygnus cargo craft atop an Antares rocket April 17 from Wallops Flight Facility in Virginia and take a two-day trip to the station. SpaceX is readying its 17th Dragon cargo mission for an April lift off from Cape Canaveral in Florida and a three-day ride to the orbital lab.